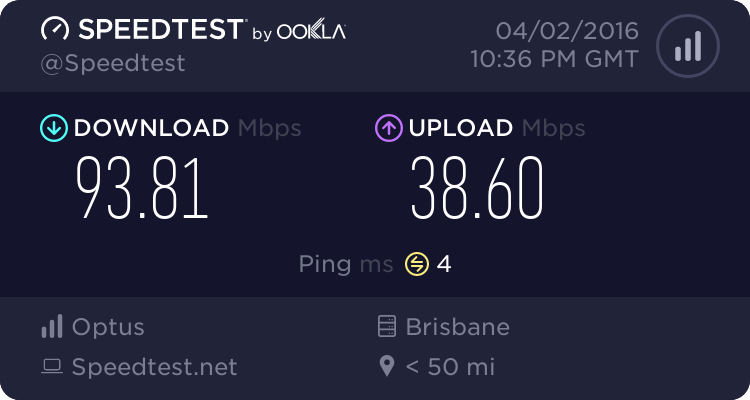 Recently we had an Optus NBN connection added to the existing iiNet connection we already have at the office. I thought it would be an interesting experiment to do some speed tests on the two networks, and compare both networks, as well as comparing the rated performance of the connect with the real world performance. In these tests, we setup each connection with a single computer on it. Because both connections are at the same address, we’re comparing true apples with apples, and all tests were run within minutes of each other to avoid any issues with different loads in the ISP’s networks during the day. The first test we did was to see how well the ISP can deliver content directly to the end user. 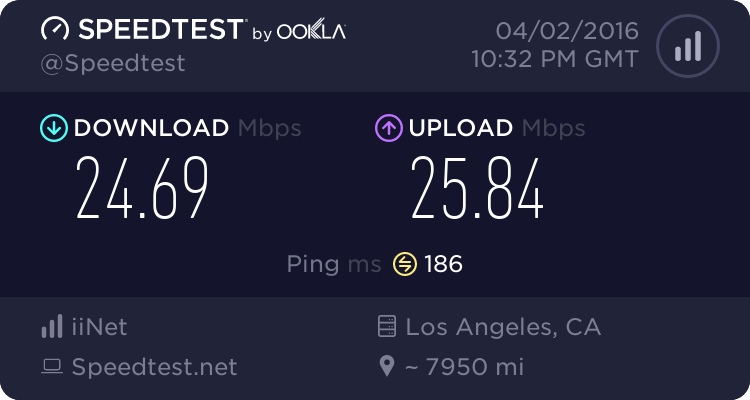 This means we ran a speed test hosted with the ISP we are testing, so there is basically nothing between the test site and us. Interestingly, Optus have double the ping of iiNet, suggesting that their network has more latency in it. For most users this wouldn’t matter, but if you enjoy playing online games, more latency is a bad thing. All of that said, the real world does not live on your ISP’s network. Most of the popular sites that we use every day are hosted in the United States, so a test with data coming from the US will show us a lot more useful information. 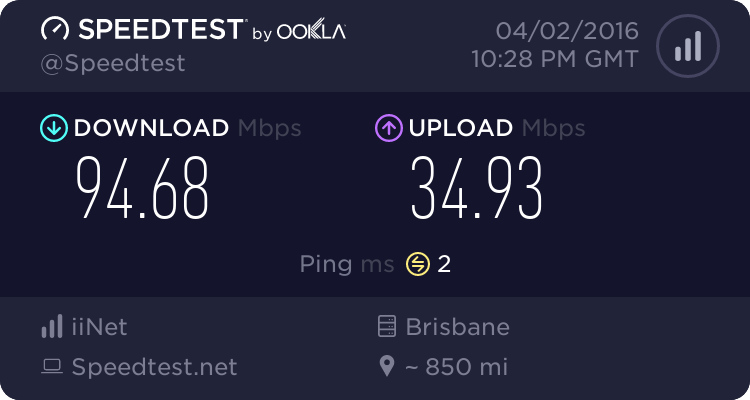 First off, again, there isn’t much difference between the two ISP’s, but surprisingly, Optus manage to deliver more speed, at least, enough more speed to be noticeable with around 25% better performance. It was expected that iiNet would shine at this point, but clearly Optus have invested in their network in recent years. What’s more important, however, is the dramatic drop in overall speed you see here. It’s what those in the know have been saying since the NBN was first suggested; The problem in Australia is as much international capacity as it is the last mile connection speed. You see, you can’t get data into your computer faster than the slowest link between you and the content you want to access. 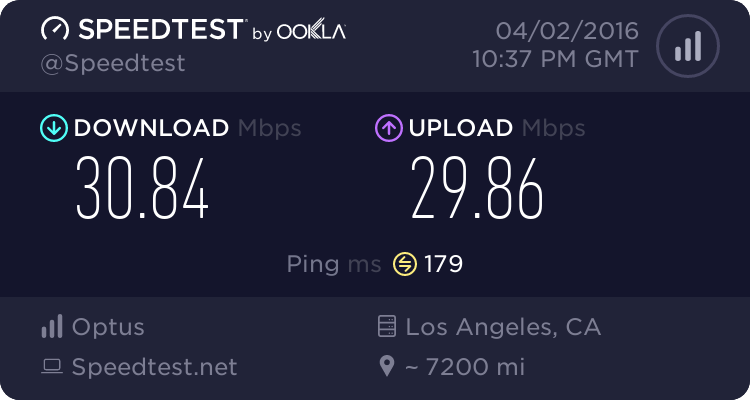 You can see from these speed tests, that despite us having a 100 megabit connection, we can’t get data much faster than 30 megabits. For home users, this suggests that paying for a 100 megabit connection is probably a waste of money. It’s not all bad news however; Businesses and homes with quite a few regular internet users will still benefit from a fast local connection. This is because different users are pulling data from different locations at the same time, and having a fast local connection means all of those different connections can come down as fast as they are able. 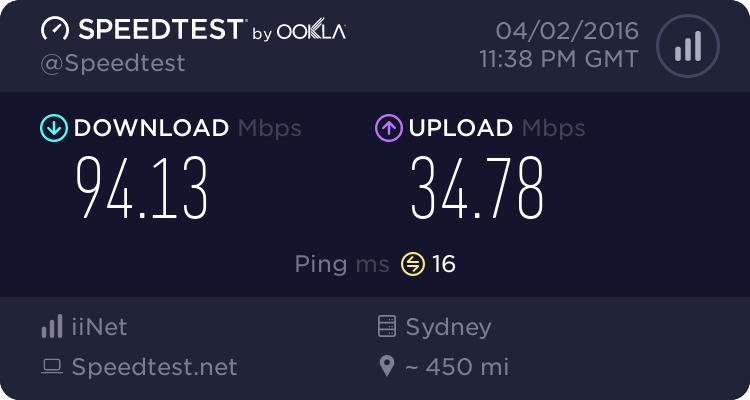 Finally I thought we’d run a speed test against an independant server in Sydney, to show if there are any significant differences in the two ISP’s Australian networks. Remember, just because they are both “NBN” connections, doesn’t mean they will automatically be the same, as each ISP operates there own Australian and International networks, and the NBN only deals with the local connections to the end users. The good news for Optus here is that they are on par with iiNet in connections to Sydney, so there’s no technical reason to avoid them. The real problem with Optus is they bundle so much stuff you probably don’t want into the deal, but on the flip side, their bottomline price is still very competative, so even if you ignore the extras, you’re no worse off.